Nobody has ever yet provided me one clear example of anything that has occurred in the state of Georgia that the RFRA bill would have prevented. 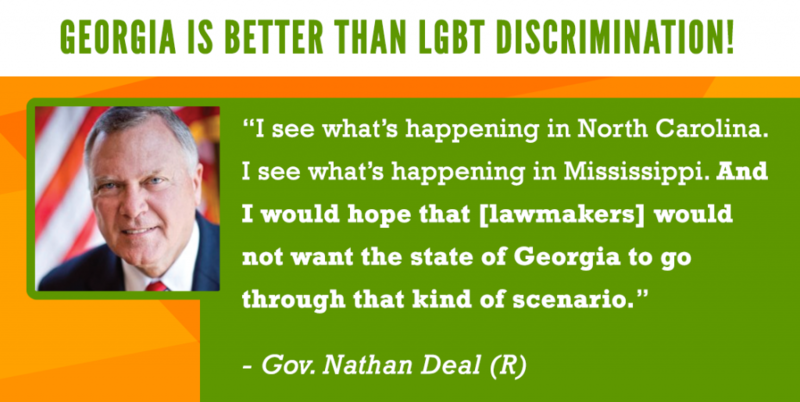 Within a week or so of Governor Nathan Deal’s HB 757 veto, both North Carolina and Mississippi passed pieces of legislation (HB 2 and HB 1523, respectively) viewed nationwide as the two most egregious anti-LGBT bills the country has seen to date. And the backlash has been swift and severe. As of yesterday’s reporting, North Carolina has already forfeited $3 million in tourism revenue from cancellations directly related to the anti-LGBT legislation, as well as thousands of jobs and millions of dollars in future investments as, one by one, companies like PayPal, Deutsche Bank, and Lionsgate cancel planned expansions. Rock icons Bruce Springsteen, Ringo Starr, and most recently Pearl Jam and Boston called off concerts in the Tarheel state. Award-winning rock star Bryan Adams cancelled his show in Mississippi. Rock fans are peeved that they’re being punishing for lawmakers’ shameful mistakes. Meanwhile, hard workers and taxpayers could be footing a steep bill—in terms of jobs lost and costly lawsuits—for decades to come. Not to mention the gay and transgender North Carolinians and Mississippians who must now bear the weighty burden of being made explicit targets of discrimination by their own elected officials. You can read more about North Carolina’s HB 2 and its impacts here. And find out about Mississippi’s HB 1523 here. Whereas Georgia was lauded nationwide—by conservatives, businesses, LGBT advocacy groups and more—for rejecting anti-LGBT discrimination, North Carolina and Mississippi have invited national ignominy and economic boycotts. This does not go unnoticed by other southern states—and they’re by and large following Georgia’s lead. Just this week, Tennessee lawmakers withdrew from consideration an anti-trans bill (HB 2414/SB 2387) that would have targeted transgender students for discrimination by forcing them to undergo “gender inspections” and prove their identity matches their biological anatomy before using the bathroom. South Carolina Governor Nikki Haley has come out against a similar anti-trans bill (SB 1203) that sits before the State Legislature, saying she doesn’t “believe it’s necessary.” The bill has been stalled in committee and will be officially dead if it doesn’t advance by next week’s crossover day. Meanwhile, Louisiana Governor John Bel Edwards signed an executive order one week ago protecting LGBT state employees and contractors from discrimination. While it isn’t a permanent or comprehensive solution to prevent discrimination on the basis of sexual orientation and gender identity, the executive order sends a clear message that anti-LGBT legislation is not on the menu. If you want lawmakers to drop the anti-LGBT legislative attacks in 2017, and focus on building on Georgia’s legacy as a leader of the south, click here and send a message today.